Gavin Griffin and Chad Brown were announced as the two newest members of "Team Pokerstars" on Friday after the behemoth online poker room inked the two to deals. Griffin and Brown join Greg Raymer, Daniel Negreanu, Vanessa Rousso and Bertrand "ElkY" Grospellier as fellow members of "Team Pokerstars". Gavin Griffin was an absolute no-brainer signing for the company. He is young, charismatic and has already enjoyed an incredible amount of success over his young career. Griffin is the only player to ever win a European Poker Tour event, a World Series of Poker event and a World Poker Tour event. Griffin kicked off his already amazing career by winning a bracelet at a Pot Limit Hold'em event at the 2004 World Series of Poker. Then, in March of 2007, Griffin won the EPT Grand Final event in Monte Carlo, taking home over $2.4 million dollars for his efforts. Then, in January of 2008, Griffin became the first player to ever win poker's "Triple Crown" by winning the 2008 Borgata Winter Open in Atlantic City, taking home $1.4 million dollars in the process. Griffin is just 26 years old and already has nearly $5 million in total cashes under his belt. Griffin will be a great addition to the Pokerstars roster. Even though Chad Brown doesn't have any major victories under his belt, he is a solid players who always seems to be near the top of the leaderboard in any major event. Brown has nearly $2.3 million dollars in total lifetime earnings and a number of strong finishes, including a second place finish at the 2007 $5k Championship No Limit 2-7 Draw Lowball event and a second place finish at the 2007 National Heads-up Championship. Brown used to be a professional actor before he turned his attention to poker, and has done quite well for himself since then. He is the boyfriend of fellow "Team Pokerstars" member Vanessa Rousso - maybe this had something to do with him signing the deal? With the World Series of Poker approaching, Pokerstars was likely attracted to the fact that Brown has 19 WSOP cashes. Brown also took down the $5k H.O.R.S.E. event at the 2006 WCOOP, winning over $220k under his alias "stelladora". 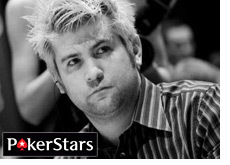 Pokerstars has quietly built themselves an impressive roster of poker talent. It is hard to match Full Tilt Poker, who seems to sign someone to a deal every week, but Pokerstars has managed to cultivate a very impressive roster of talent that appeals to many different demographics.